These Low Carb Coconut Flour Crepes are not only easy to prepare but result in perfect, thin pancakes. Fill them with sweet or savory low carb fillings for the perfect breakfast, lunch, dinner or dessert! I am so excited to bring these crepes to you today because….. I. LOVE. CREPES! I could have crepes a different way, EVERY DAY, and be so happy. Just look at those beautiful, soft, golden, perfect little French pancakes. Yum! You’d be hard pressed to find a more versatile food as crepes can be filled with almost anything savory or sweet. I confess to like sweet crepes the best; filled with sweetened whipped cream and low carb berries, then topped with more whipped cream and a little melted chocolate. I can’t think of an easier dessert. And breakfast can be as simple as a little cream cheese and low carb jam. 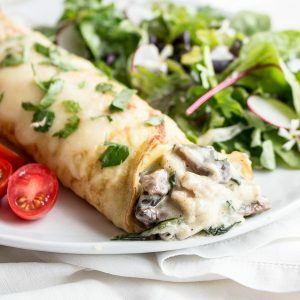 But, there is nothing like a savory crepe; with a delectable filing, baked in the oven, and topped with a creamy or cheesy sauce — that’s good eatin’ right there! I’ve been meaning to bring you a crepe recipe for quite some time now. But because crepe making is an art which takes practice to master, crepes are not always a popular dish. The pan has to be the right temperature. The batter needs to sit for a few minutes. And of course the first crepe almost always breaks – but not with this recipe! 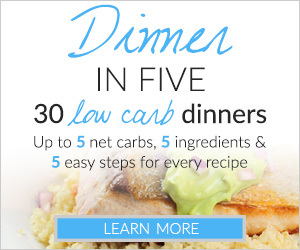 Not only is this recipe gluten-free and low carb, but it is easy and almost no-fail. You won’t need any special equipment for these crepes except for good non-stick pan. The only technique to master is the pan-tilt-and-swirl to spread the batter — no “crepe-batter-spreader-thingies” needed. I’ve been using a Green Pan for about a year now and I think it has one of the nicest ceramic non-stick surfaces around. 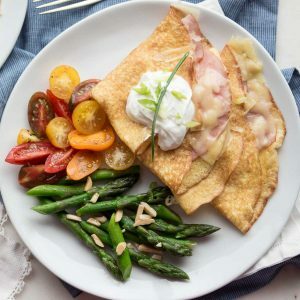 I also have a French steel crepe pan that I purchased from Williams-Sonoma many years ago, but it just isn’t needed for these no-fail low carb crepes. I spent many hours and used many, many, eggs to get this recipe just right. And, I must have tried every known low carb ingredient combination possible to get it there. I tested almond flour, coconut flour, a combination of almond and coconut flours, ricotta cheese, cream cheese, heavy cream, almond milk. I found that the secret ingredient was Parmesan cheese. Yeah, I know. It’s a weird ingredient, but it worked. Somehow, the cheese gives these crepes flexibility and strength — resulting in virtually no-fail crepes. And the coconut flour is pretty important as it provides some thickness. If you’re worried about the time commitment to make these crepes, don’t! The whole recipe only only takes 20-30 minutes from start to finish and they don’t need to be baby-sat while they are cooking. Set your kitchen timer and flip when it goes-off. These stack very well without sticking and also refrigerate like a dream. 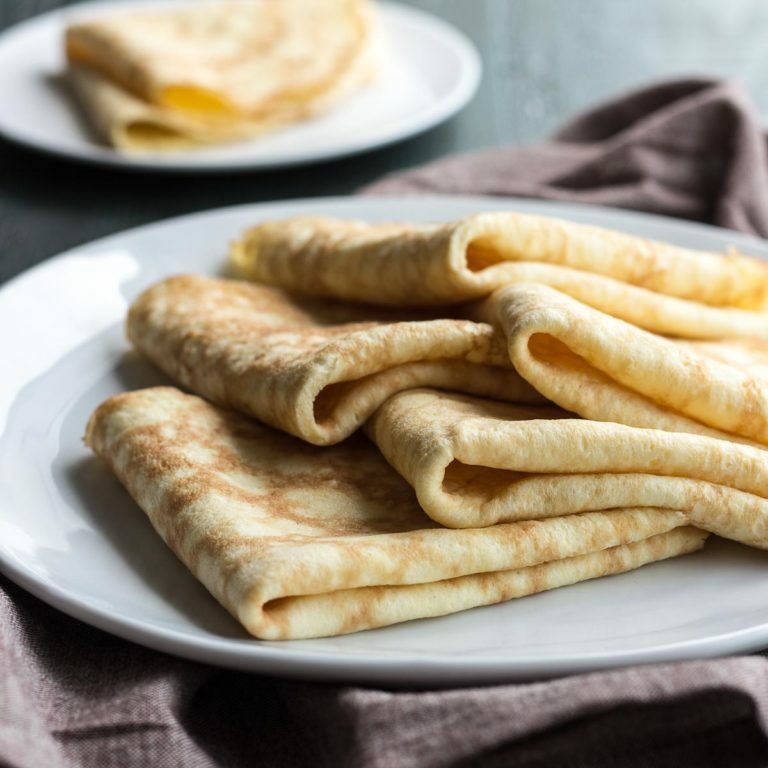 I have not frozen them yet, but I’m sure that if you place a piece of waxed paper between each of these no-fail low carb crepes, you will be golden. Make sure to read the tips on how I flip them so they don’t tear. Low Carb Crepes (Coconut Flour) is 1 net carb! See how I tilt-and-swirl the pan to spread the batter and then flip the crepe on my INSTAGRAM VIDEO! Don’t forget to follow me, too. 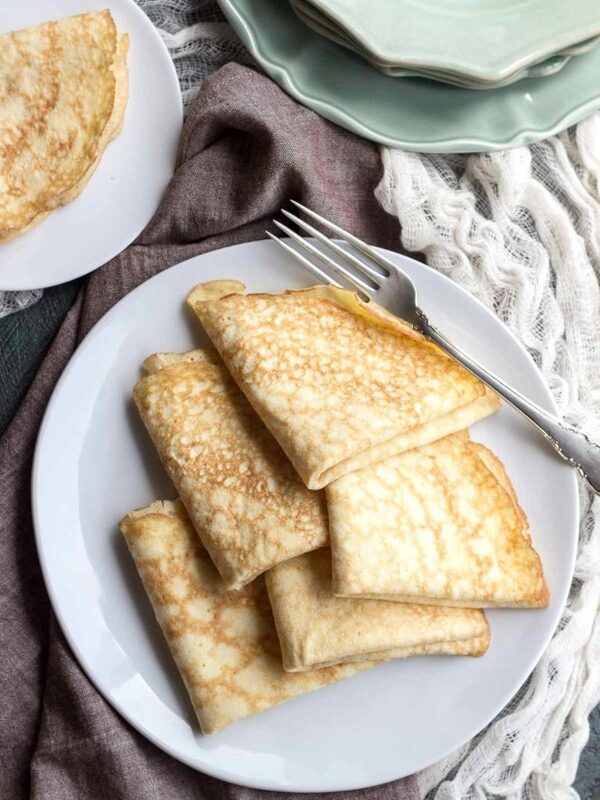 These low carb crepes with coconut flour are not only easy to prepare but result in perfect, thin pancakes. Fill them with sweet or savory low carb fillings for the perfect breakfast, lunch, dinner or dessert! Blender: Place the eggs, cream cheese, Parmesan cheese, and erythritol in the blender. Blend on low until the ingredients are completely combined. With the blender running, sprinkle the coconut flour and the xanthan gum over the batter and continue blending until thick, scraping the sides down at least once. Finish with the blender on medium speed for a few seconds. Let the batter sit for a few minutes. Prep the Pan: Put a non-stick pan over medium heat. When a drop of water sizzles and jumps across the surface, it is ready. Turn the heat down just a tiny bit and lightly brush the pan with butter. Lightly brush the spatula, too. Tilt and Swirl: Stir the batter. Pour the batter into a 1/4 cup measure and then into the middle of the pan. Resist the urge to scrape the measuring cup out with your finger. Grasp the pan by the handle and begin tilting it in a circular motion to spread the batter into a circle. It won't be perfect and that's okay. I can get the batter to go around the pan 3 times, ever increasing the size of my circle before it stops, resulting in a 6-7 inch crepe. Cook, Shimmy and Flip: Let the crepe cook for about 1 1/2 minutes or until the top of the crepe looks dull and the edge browns. You can touch it with your finger to see if it's still wet or just about set. Now, gently work the spatula under the edge of the crepe by shimmying it and lift the edge. With the fingers of your other hand, gently grasp the crepe and lift it a little higher while sliding the spatula under the crepe further. Flip the crepe and let it cook for about 15-20 seconds more. Stack: Remove the crepe to the plate and begin the process again making sure to lightly butter the pan and the spatula after each crepe. Stack the crepes one on top of the other. Let cool and refrigerate or use right away. To freeze, place a piece of waxed paper between each crepe before putting into a zip-loc bag and placing into the freezer. Makes 8-10 crepes. The heat may need to be adjusted up and down just a little while cooking the crepes. I have a gas stove and I find that heating the pan at medium and then turning the heat down just a touch is perfect. With an electric burner, one may need to watch the heat a little more closely as the rate at which it heats up and cools down is a little slower. Terrible recipe. I don’t know what this is, but it’s not crepes. It comes out as being a thick jelly like paste which is the opposite of what crepes should be. I had to add a lot of water to try and salvage the disaster of a recipe. Hi. What type of cream cheese do you use? Something along the lines of Philadelphia or Mascarpone? Thanks. Very eggy! Made for substitute for cheese manicotti but not quite the flavor I was hoping for. Held up really well though if that means anything? Oh, Kim…thank you!!! These are so good I will never go back, even if I go off Keto. They are easy and taste great. I misread the recipe the last time I made them. I was doubling and read 1 t for xanthan gum instead of 1/8, so I put in 2 teaspoons!!! YIKES!!! I kept adding water till it got to a consistency that I could use. They still tasted great and I got more, so that was wonderful! Anyway, I have recommended these to everyone I know on Keto. THANK YOU!!! I had to register just to leave a comment on these-they are soooo good! I never thought I would be able to make crepes but your directions were right on. I used kite hill almond milk garlic cream cheese instead of regular and powdered stevia, 1 scoop. Didn’t have any xantham gum but they were ok without that. Also used Montamore Parmesan/cheddar. Filled with chicken salad and they were delicious. Stored in zip lock bag with paper towel in between and they reheat in the microwave in 10-15 seconds and taste just as good as freshly made. Thank you. Did you ever try Almond flour? If so, how did they compare to the coconut flour version? Love your recipes. This one came out like a bunch of (very tasty) flat omelettes. Is that right, or did I do something wrong? My husband has been trying out pancake and crepe recipes for quite a bit. The search is over! These are delicious! I had made a cream cheese fluff with cream cheese, fresh clementine peel, heavy whipping cream Wallaby 4.5 % fat plain yogurt, sour cream, Swerve, and Splenda Naturals (stevia) to serve with berries and a homemade cranberry sauce made with fresh whole cranberries, the same sweeteners, and pink salt to cut down on the bitter taste. We filled the crepes with these and added a few raspberries blueberries, and blackberries to each. Yum! 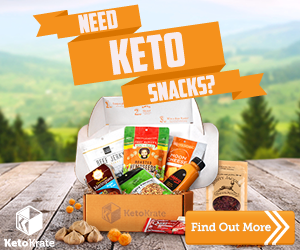 These babies are GOOD…not just Keto good but genuinely delicious!!!!! This is a breakfast staple at our house now! We pair this with cream cheese fluff (http://screwedonstraight.net/keto-desserts-cheesecake-fluff-edition/), berries, and sometimes a little lemon yogurt. Sooooooo good!!! Just made these on a rainy Saturday morning to have to eat on throughout the week. Your tips really helped me master flipping and sliding onto plate. The buttering tip on pan and spatula for each crepe was superhelpful. Mixing up some cream cheese and sweetener to mix with berries for filling. Very tasty! Want to try the entree recipes, too. I made manicotti tonight and it was amazing! Thanks for the recipe. Question for you? Do you leave the parmesan out for sweet dessert crepes? Okay….I know I’m a little slow. I’m now following you on Instagram, but I can’t figure out how to find the video. I don’t want to make these until I watch it and I desperately want to make them since I can’t WAIT to try your chicken enchiladas. Help!! I have loved all your recipes so far. Thank you for all the time and effort you put into this! Thank you! I’m going to make these this tomorrow and white sauce chicken enchiladas this weekend. This Texas girl can’t wait for some good Tex-Mex style food! Awesome!! I love this recipe. Great taste same texture as regular crepes. Fluffly and light. I got around 12 crepes. Can you omit the Parmesan or Asiago cheese for a sweet crepe? Can you sub Konjac powder for X gum, and in what amount? THANK YOU SO MUCH for your magnificent and gorgeous crepes recipe!!!! You save my life. I cannot describe in words my feelings. All my life I loved to eat crepes in different ways, but when I started the Keto diet was hard for me to live without crepes. I tried many others recepies, but I wasn’t happy with the process and results. 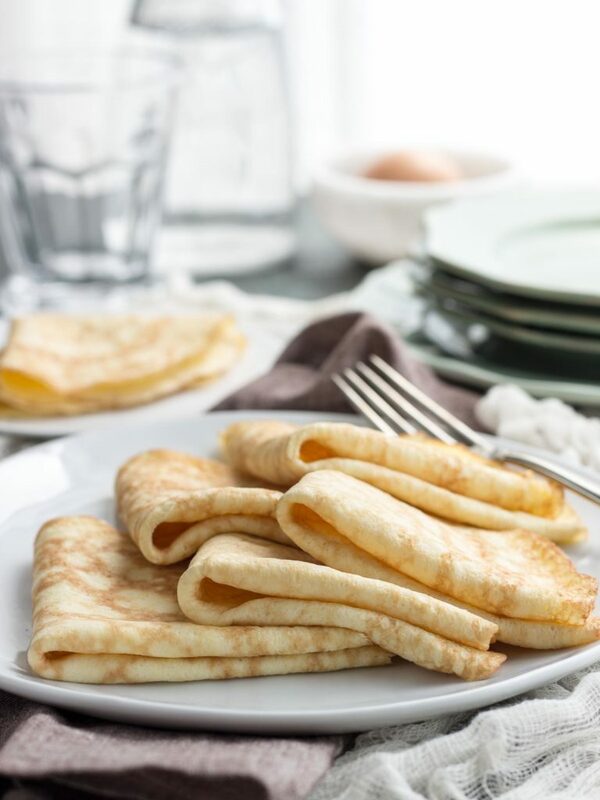 I wanted to make them healthy, easy, and fast, so thanks to your recipe now I can make crepes every day, like I used to do my entire life, fast, but now even healthy. You are my HERO!!! I have to say that I did some changes in recipe. I omitted the sweetener stuff, Xanthan gum, and I added 150ml of Almond milk or Grass feed milk (I tried in different ways, because I like them thin and soft). For sweet version of crepes I also omitted the Parmesan cheese. So, from 6 eggs, 6 oz of cream cheese, 150ml of milk and 1 1/2 tbsp of coconut flour I usually get 15-16 crepes with diameter of 18cm. For me this is awesome!!! These were fab! I made them for the whole family, and they were eaten with either sugar-free clotted cream drizzled with a sugar-free berry compote by husband put together or with sausages and bacon. They were the slightest bit cheesy because of the Parmesan and the texture was a little different to regular crepes, but we were expecting that and were happy enough with the trade-off as we still got to enjoy crepes! I can’t wait to try and make spinach & ricotta cannelloni using these – I’ve really missed that dish. I was hoping to double up the recipe this weekend but sadly didn’t get the opportunity as Scotland’s in the middle of a snowstorm-fuelled freeze and the stores are running out of EVERYTHING. Absolute madness! Thank you millions once again for such a fabulous recipe. Loved this. Reduced the recipe as I only had 2 eggs at the time. Filled with raspberries and yogurt! Got 3 crepes from it…perfect! Great for my LCHF diet!! Thanks. What is the serving size? One, two, three? 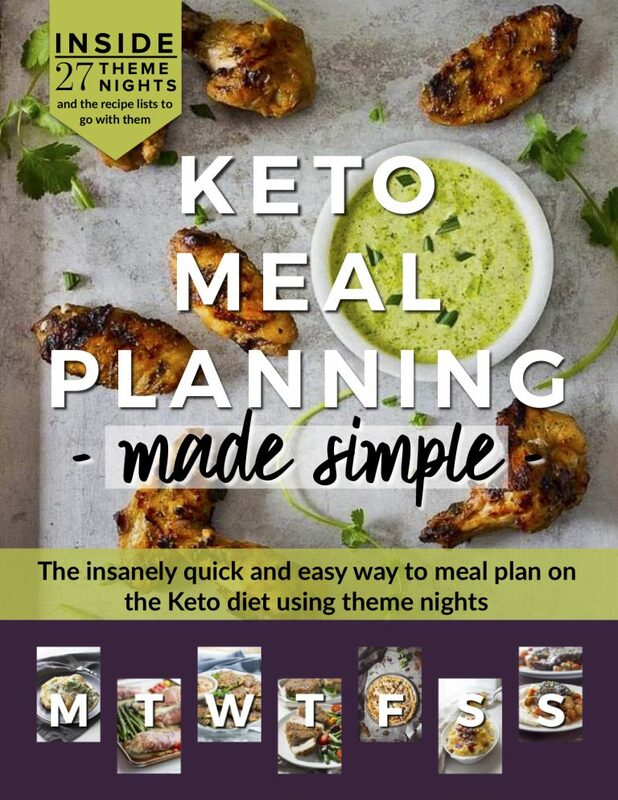 But seriously, I’ve been eating Keto since August and in spite of the fact that I am a pretty decent cook, I have had SO many Keto recipe fails, which has resulted in a lot of frustration and a lot of wasted food. These are incredible. I made them for dinner tonight and was truly astounded. After living in Paris for a while, I am admittedly a bit of a crepe snob and I really found these to be an incredible substitute. Don’t get me wrong, of course, they taste different than the real thing, but you did a fantastic job of getting both texture and taste to be truly enjoyable. I am so grateful. Any that you REALLY recommend that I try? Thank you again! Hi Dani. I am so glad you appreciate the crepes. I worked really hard on the recipe. Some people want as few ingredients as possible and are willing to settle for “meh”. I’m happy you appreciated the texture of these. You made my day. As far as recipes to try? That is so hard as it is a matter of personal taste. I love the Salmon with Bacon Cream Sauce, Chicken Poblanos with Cream, Mexican Pork Chops, Beef Stew, Chicken Florentine Crepes, Spinach Artichoke Dip, Hamburger Steaks, Sloppy Joes, Hamburger recipe. There are so many. I only post recipes to things my family likes, so it’s hard to choose a few. Do you have a video other than on instagram for these crepes? Yea, I made these for dinner last night for my daughter and son-in-law who are eating low carb. We also had a friend over who is not eating low carb. I hadn’t made these before so I found myself “apologizing” for our “diet food” because he happens to be a phenomenal Italian cook. I’ve had some of the most amazing pastas and chicken parmigiana at his house. When I served the manicotti, everyone raved! Including our friend. He couldn’t believe it was low carb. I served it with a mixed green salad and homemade bleu cheese dressing. I made an extra platter to send home with my daughter for an easy microwave lunch for work and she was so grateful to have something different than their standard lunch fare. Thanks for making me look so good! 5 Star all the way! (the only change I made was adding an additional egg because I only had medium eggs, not large eggs, plus I added a shake or two of granulated garlic and eliminated the erythritol) Other than those minor changes I followed the recipe. I just realized I posted this on the crepe recipe site, instead of the manicotti site. I used your manicotti recipe. We just had those last night and my husband just reminded me he would love to have them again this week, so I’ll need more ingredients. I suppose that means this recipe is perfect for entertaining and for regular weeknight dinners. I really wanted to try this recipe but since there is no way to pin it to Pinterest then I will never find it again which I personally fell is wrong. I fell this is wrong since I just pinned about her of your recipes that uses this recipe as a main part of it. I do not want another app that will hold recipes so I will not do Yummly as I feel there is no reason for a second recipe app. On the calories, fat, net carbs and protein, is that for the whole recipe or for each crepe? Does it need the xantham gum? I really don’t want to buy any if it only takes 1/8tsp. Where do I find the xanthan gum? Like which isle in the grocery store? Thanks! Hi Kim – ty for sharing recipe. I didn’t have luck cooking the crepes. They just kept falling apart. Any thoughts on what I might need to change. The flavor is wonderful! Can a different flour than coconut be used? My daughter is allergic to coconut. Thanks. To make the crepe recipe I want to make 3 servings but 8 servings is a lot. So how much for each item on the recipe would I put instead for 3 servings? Thank you and can’t wait to try it!!! I made the recipe exactly as written. The crepes were awesome and the entire recipe was absolutely incredible. My husband could not believe how great they were. We will be making the crepes all the time and the chicken spinach florentine will be used anytime we have company or want something great!!! Give it a try and tell us if it worked! Wow, these are the first keto crepes that I actually like the flavor of, AND my three kids like them too, although thy eat theirs with cinnamon sugar. Thank you for the recipe! We eat these with Parmesan cheese sprinkles on them, roll them up and place in a casserole dish and ladle homemade chicken broth over them and sprinkle with more parmesan. Just hear and eat. Great with a green salad. These crepes are great. The addition of parmesan cheese takes away from the egg taste. On their own with no toppings, they still taste eggier than I’d like, but I suppose that’s unavoidable with keto/gluten free crepes. However, these go very well with both sweet and savory toppings. I have tried them both ways with the recipe as-is and they are wonderful. They are sturdy and deal with moisture well. They store well in the fridge, they aren’t rubbery at all, and I’ve even tried them as a replacement for manicotti which has been awesome! The carb and calorie content are especially awesome. 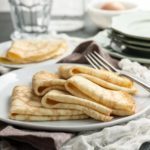 These are among the best crepe recipes I’ve found, they serve their purpose and scratch the itch, but I still pine for something closer to the real thing. Can you show how you get to 1 net carb? I put this recipe in my fitness pal and it came up with 3 net carbs per serving..I checked the carbs and fiber on each ingredient and it does seem like it is 3 net carbs. I used a full fat cream cheese (Gina Marie Old Fashioned Cream Cheese), other than that I don’t see where the extra fiber is coming from. They were easy to make, delicious and I will definitely be making them again. I didn’t have Parmesan on hand so used a hard sheeps cheese that was very mild and it worked very well. It wasn’t sweet or savory which was nice because now I can use them as either. I ate some with butter and homemade low carb maple syrup (fenu greek for the maple flavor), they were very good! Almond Flour: I weigh my almond flour and then enter the weight in grams (more accurate than ounces) and choose blanched almonds as the ingredient category. I have found that in entering, for example, 1/2 cup almond flour, the program makes an assumption and gives me a carb count much higher than if I weigh the ingredient and add it in by weight. I have found that true for all ingredients I have entered by volume measure. Furthermore, I have found by using Fatsecret, that there are pre-programmed servings of common ingredients. I never use those. If I used the 2 tbsp single serving size multiple times to add up to a cup, then my counts would be off. Also, different brands have different counts for some products. One brand of mayo in Fatsecret has a LOT of carbs because of added sugar while another brand does not. I am usually very careful about how I enter ingredients into any program, but I am only human and I do make mistakes from time to time. 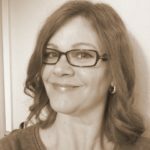 Because many of my readers have diabetes, I strive to get the most accurate carb counts possible. Thanks for the sheep milk cheese info! (Grrr.. so much on my ‘allergy no fly” list…..I have a cow milk allergy in addition to wheat, which was already covered, phew) so was looking to see what might substitute for the parmesan. These look so versatile and yummy!! I made these, let them cool, rolled and sliced pinwheel style to get “strips”, then topped with Chicken Alfredo. Exceptional!! Thanks for the amazing recipe! I made these this morning … just added a little extra stevia … filled with some sweetened cream cheese (spread thinly) macerated berries and topped with homemade whipped cream. They were beyond delicious. I only made 4, and I put the batter in the fridge. I am going to add some ground flax to it tomorrow and make more of a pancake and see how that turns out. I think it will be just wonderful. Next week I am going to make the recipe exactly as published and add some lump crab with a low carb mornay sauce!! This is a recipe that will become a standard in my house. The pancakes were just fine. I made more batter and stored it in the fridge to see how it would stand up. I made the fruit crepes with cream this morning (Valentine’s Day Breakfast … perfect!) with the batter that was stored in the fridge, they worked absolutely fine. This is an awesome discovery for me, mix up some batter and it keeps in the fridge for a few days for a quick crepe fix. I’m loving this recipe more and more each day. FYI the crab crepes turned out fantastic!!! Hi Joan… addition of ground flaxseed is an idea i have been toying with too. May i ask how much did you add and did it reduce the tanginess of the cheese? Did you add water too? Looks like a very good recipe. but I am more excited that your website has a link to Jump to Recipe!! I am so tired of having to scroll. scroll, scroll, only to find that I may not be interested in a recipe. Great job! Hope you share with other websites! These were fantastic! And such a surprise! Not that your recipes arent wonderful, but I hate eggs and had my doubts about these. I even ate chicken florentine filling all alone last night thinking that the crepes weren’t for me. Ive tried s bunch of the bread-y substitutes and they always just taste like a microwaved egg to me (and go right in the trash). These are rich and savory and didn’t taste like egg at all! You’re a genius! These look delicious! :) But, I HATE the taste of coconut flour. I tried to love it, I really did. But I just can’t. >.> I know you said it’s optional, that it’s for the texture. What does it mean? What will happen if I skip it? Are these sturdy enough to be used as wraps? 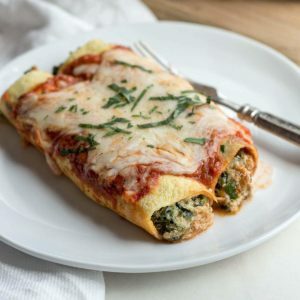 Do you have a recipe showing exactly how to use them with manicotti? Sounds good but I need step by step please because I have never made it. Thank you! I. LOVE. CREPES too!! :) So excited to try this! Thank you for this recipes. I just didn’t have much faith in the recipes with eggs and cream cheese only. I usually make tortillas using the pork rind pizza crust recipes from Linda Low Carb website, but I decided to try out your recipe. They turned out great and didn’t have much problems with them falling apart. After mixing, I did notice that the mixture seemed a little gelatinous, so I added 2 tablespoons of chicken broth(it’s what I had on hand). I also added some garlic granules and a little dried rosemary. Also, since I only had jumbo eggs, I used 6 eggs and an 8 oz package of cream cheese. This yielded 10 crepes to be used for the week. Okay, I would love to make a sweet version of these. Have you done that before? If not, do you think that switching out the Parmesan for mozzarella would be the way to go? It seems like that might make them more of a pancake thickness than a crepe thickness, but I just don’t know. I can’t get strawberry crepes out of my head now! Tried making these today. My batter ended up too thick so when I cooked it wouldn’t swirl and spread. Perhaps I overdid it on the Xantham gum. I tried thinning out the mixture which seemed to work, but my attempts at flipping were disastrous and my crepes folded over on themselves. I guess this is something that takes some practice.Even though I had mushed crepes, I did try and the taste and texture is excellent. Shaun. Let the crepes cook almost completely before flipping. Then just heat on the other side for a count of 10-20. Did you go on my Instagram and see how I flipped them? Look for the cruddy photos of the yellowish pan. When I haven’t made crepes in a while, I always get a few that tear or fold over. I eat those at the stove! Shhhh. Don’t tell. :) I’m sorry yours didn’t turn out for you. If you have an electric crepe maker, people have had success using this batter on them. I have a crepe maker. Can I use it for this recipe? Fabulous melt in the mouth crepes! We substituted cream cheese spread instead of cream cheese. We also did not add any sweetener, insteam ate with honey and or chicken curry as sides. Yummm! They are great! I really love that they don’t taste like eggs. The Parmesan adds a nice savory flavor. I’ve made these twice in a week. Thank you so much for adding some variety to my life. I can think of all kinds of ways to use them. I’ve been on a low carb diet for two months now, and mostly been eating a whole lot of pre-packaged, made in factory ‘food’, like pancakes, that are basically shakes that you throw in a pan, and then eat, and enjoy.. or not. I decided I want to go low carb the right way, with as many home cooked meals as possible. So boy was I glad I found your blog! Forgot to give 5 stars to this recipe! Thank You! 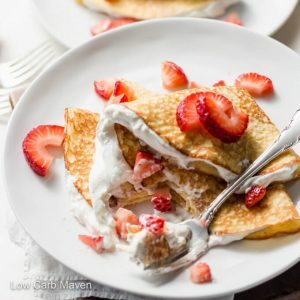 The best low carb crepes! I used psyllium husks instead of xantam gum , worked great. Next time I will decrease cheese , because I want to find some base crepe for sweet filling. Hi Lelde. Thanks for the comment and the rating. I’m glad to hear that the psyllium husks worked. I had this recipe in mind as a savory recipe as I am trying to cut back on desserts. I am so glad you liked it. Have a great day! I adore crepes and I never thought that a flourless version could look so perfect! Love your revipes and am looking forward to making the crepes. Please share some ideas and methods for a savory crepe filling. Thank you. I made these crepes today but used a bit of glucomann in place of the xanthan gum (because it’s what I had available. Mine turned out much more yellow in colour but the texture and flavour was terrific! I used them in place of manicotti shells…and they made a WONDERFUL pasta substitution! How do you use them as pasta substitute? Love crepes, but am new to making them myself! Oh my gawsh, I LOVE crepes! There is a restaurant here that is called Crepes and all they sell are crepes.. every type of crepe you can think of. It is heaven! And these crepes look like they could give that restaurant a run for their money, friend! I love that these are low carb! Now I can eat crepes daily and not feel so guilty! WINNING! Cheers, dear! I see xanthan gum in a lot of low carb recipes and also in commercial products. What is its purpose in a recipe? Thanks in advance & for all the great recipes you post. Yes it does, thanks! I tried making the low carb pancakes a little larger to use for a wrap & they did not hold together-this is probably the reason why. Thanks again! 1. I am planning to use a creamy chicken mushroom spinach sauce (similar to your chicken Florentine). Will your basic low carb crepe recipe work or should I use your other crepe recipes? 2. What size pan will l need to make crepe if I am planning to fold them instead of roll them.